Above all else, Doncaster Rovers just needed to win the game. Performance was secondary, the result was everything. Darren Ferguson, having overseen six defeats from the previous eight league games, did not want to be in the press room after this match talking about concentration issues, missed chances or dissecting another decent display that yielded anything less than three points. John Marquis equalizes just before half time. And he got his wish - and plenty more - as Rovers came from behind to smash Southend United and tick several boxes in the process. 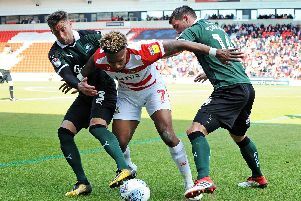 The stylish victory ended Doncaster’s frustrating wait for a first league win at the Keepmoat Stadium this season at the sixth time of asking. Better late than never. It was also the first time this season that Rovers had scored, never mind came from behind to claim any points, after conceding the first goal in a game this term. AFC Wimbledon, Northampton Town, Scunthorpe United and Bradford City had each scored first against Rovers and ended up winning the game to nil. No signs of a comeback. Tempers flared after Wordsworth clashed with Houghton. Things were conspiring against the home side again when Anthony Wordsworth, who arguably should have been sent off for kicking Jordan Houghton, put United in front after 38 minutes. But this time Doncaster really dug in, collectively rolled their sleeves up and turned the game on its head in spectacular fashion. They have got it in them then. In the process Ferguson’s men - thanks in no small part to a sensational ten-minute hat trick from midfielder Ben Whiteman - scored one fewer in 90 minutes against the Shrimpers than they managed in total in seven league games in September. Goals, goals, goals; just what Ferguson had wanted to see. The timing of John Marquis’ equaliser, in first half stoppage time, was crucial to the victory as it allowed Ferguson to galvanise his players at the break and send them out for the second half with the bit between their teeth. Ben Whiteman strokes home from the penalty spot. And the barnstorming Ben Whiteman Show that quickly followed proved to be Rovers at their very clinical best as they blitzed Southend in a very similar fashion to how they put a few League Two teams to the sword last term - a ten minute period during which the visitors simply could not live with Doncaster and their on-loan Sheffield United midfielder. When Rovers have won in the league this season, against Blackburn, Plymouth and now Southend, they have won at something of a canter. Fine margins went against them last month. What they cannot now afford is for their latest victory to be another flash in the pan. The same battling spirit evident during a niggly first half and at 1-0 down will certainly be required from the start this weekend for a tough trip to Charlton Athletic. Portsmouth at home will then be another big test. Rovers celebrate the fourth goal. Rovers require much more consistency and plenty more of the clinicalness that was on show against the Shrimpers if they are to continue climbing the League One table. This game could have been very different had Wordsworth walked for kicking Houghton while he was down. And Southend boss Phil Brown even suggested he might’ve got a better performance from his team in the second half if they only had ten men! As it turned out, Wordsworth stayed on the pitch and then rather predictably broke the deadlock when he nodded home from close range after Nile Ranger’s header was cleared off the line by Niall Mason. Something of a siege mentality, Ferguson later revealed, lay at the heart of his half time message - and it did the trick as Doncaster came out for the second period like a team possessed. It was at this point that Whiteman stole the show, but he had captain James Coppinger to thank for his first ever senior hat trick. Whiteman was in the right place at the right time to calmly fire home after Coppinger’s free kick hit the bar and rebounded straight to him. Three minutes later, after a Coppinger set piece had only been half cleared, he then produced a stunning half volley from the edge of the area which rattled in off the underside of the bar. And it was Coppinger’s decision to step aside from penalty duty which allowed Whiteman to confidently stroke home from the spot. When Whiteman’s stunning second goal hit the back of the net and the Keepmoat faithful erupted it felt like a potential turning point in the season. Rovers failed to back up their eyecatching victory at Blackburn in August and after winning at Plymouth last month lost their next two games against Shrewsbury and Bradford City. Their first league win at home since April 8 now has to be a springboard to better things. Doncaster have too much quality to be floundering in the nether regions of League One. The question is more whether they can produce performances and results like this on a regular basis.